Versatile Babes, versatile Bread, versatile Baking. We range from fluffy to filled, from artisan to artistic, dowdy to doughy and this time Elle as our Kitchen of the Month thought we should bake something Italian; Stromboli. You could say this is the savory dinner cousin of your breakfast cinnamon bun; it’s a white dough rectangle on which you arrange cheese, vegetables, herbs and sliced meat. In my case I rummaged through my fridge and found fresh spinach (yay! ), salami, two different cheeses and some left over feta, a lonely slice of ham and snipped some dried tomatoes on oil, added a hand full of olives. From the garden came basil, rosemary and thyme. The lower kitchen drawer revealed basil flavoured olive oil. Sounds good? The dough on itself was of the kind that would easily replace a stressball. So soft smooth and strong. A very touchy feely dough, in my case also flavoured with some fresh ground pepper and again the basil olive oil. Sprinkle yeast into 1 c. of the water, in small bowl. Leave for 5 minutes to then stir to dissolve. Mix the flour and salt in a large bowl. Make a well in center and pour in dissolved yeast and the oil. Mix in flour from sides of well. Stir in reserved water, as needed, to form a soft, sticky dough. Turn dough out onto a lightly floured surface. Knead until smooth, silky, and elastic...~10 mins. Pour dough in a clean, oiled bowl and cover with clean kitchen towel. Let rise until doubled in size, 1 1/2-2 hours. Punch down and shape into a ball. Let rest 10 minutes. Roll out into a 14" x 8" rectangle. Cover with a clean towel and let rest another 10 minutes. Spread your cheeses, meats, garlic and basil evenly over dough. (You can use your own combination of meats and cheeses, or roasted veggies and garlic or whatever you like for filling.) Roll up the dough like a swiss roll, starting at one of the shorter sides, but without rolling too tightly. Place on oiled baking sheet. Use a skewer or a carving fork to pierce several holes through the dough to the baking sheet. Sprinkle with 1 Tbs. of olive oil, salt, rosemary and pepper. Bake in preheated (400 degrees F) oven for 1 hour, until golden. Drizzle remaining olive oil over top. Slice and serve!! - kneaded the dough in my bread maker; a little on the sticky side but after the bulk rise: perfect. - Oh roll up from the short side?? Hmm I rolled from the long side… made for more than a foot long bread! - I was a little confused though: no second –shaped- rise? After the hordes went away… all that was left – or rather that I rescued for the picture! Come and see what my fellow Babes baked, blog roll on the left hand side! Go to Elle’s for the details on our Buddy Baking! You always get it perfect: savory dinner cousin of your breakfast cinnamon bun! LOVE that you put spinach in yours, it's always working it's way into my cooking/baking. Basil flavored olive oil: that would be perfection plus. Love the addition of spinach in stromboli, love to try them.I will see if i can get done this month. Great fillings and making it soooo long was an excellent way to get a good bread/filling ratio! You are absolutely a babe, Karen! Oh spinach! And olives! Wonderful. wonderful loaf, but how in the world did you manage to get that in the oven?? Good thing for me that I took pictures before dinner. If I'd waited til after, I'd have been taking photos of empty plates. I love how long your loaf is! lovely! just great isn't it? I have to start bread baking again...it is such a lovely process, with delicious results! 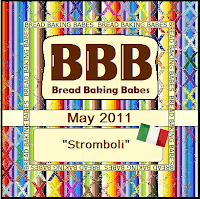 This stromboli sounds scrumptious! Knock, knock... where art thou? :o) I know you made the Buttermilk Cake but where are the pics? Ha ha. I hope you're doing well!! What a great recipe, it looks interesting and very delicious and i think it is not very hard to do it. So i will try it for sure, thanks a lot for sharing with us.